"China's continued militarization of disputed features in the South China Sea only serve to raise tensions and destabilize the region," Lt. Col. Christopher Logan said in a statement. "As an initial response to China's continued militarization of the South China Sea, we have disinvited the PLA navy from the 2018 Rim of the Pacific (RIMPAC) Exercise. China's behavior is inconsistent with the principles and purposes of the RIMPAC exercise." The action is a major step back from the unfettered military engagement policy of the Obama administration that saw reciprocal military officer and ship visits and China's participation in RIMPAC as a way to build trust with China's Communist Party-ruled military. Logan said "strong evidence" has revealed China's deployment of anti-ship missiles, surface-to-air missiles, and electronic jammers on disputed reefs and atoll in the South China Sea. "China's landing of bomber aircraft at Woody Island has also raised tensions," Logan said, referring to one of the Paracel islands in the northern part of the strategic waterway. "While China has maintained that the construction of the islands is to ensure safety at sea, navigation assistance, search and rescue, fisheries protection, and other non-military functions the placement of these weapon systems is only for military use," he added. The Pentagon has called on China to remove the military systems "immediately" and to "reverse course on the militarization of disputed South China Sea features," Logan said. "We believe these recent deployments and the continued militarization of these features is a violation of the promise that President Xi [Jinping] made to the United States and the world not to militarize the Spratly Islands," he said. During a summit in Washington in September 2015, Xi denied the reclamation of some 3,200 acres of islands, including the Spratlys, which China calls the Nansha, was for military purposes. "Relevant construction activity that China is undertaking in the Nansha Islands does not target or impact any country and there is no intention to militarize," Xi said at the time. Despite the promise, China has moved ahead rapidly with building military facilities in those islands and in the Paracels. "Even under the most optimistic views of our relationship with China, it's hard to ignore their recent behavior in the South China Sea," a military official told the Washington Free Beacon. "They only have themselves to blame for this decision." The Pentagon made no mention of other questionable Chinese activities, such as coercing U.S. allies Japan, over the Senkaku islands, and South Korea, over its deployment of a THAAD missile defense unit. The statement also did not mention China's use of a laser against U.S. pilots flying near Beijing's first overseas military base in the east African state of Djibouti. Exercise Rim of the Pacific is held every two years near Hawaii and Southern California. It is the world's largest international maritime exercise. More than 1,000 military personnel from 27 countries will take part. The Navy announced a year ago that China's PLA navy was invited to RIMPAC 2018. In 2016, the PLA sent five ships and 1,200 troops, including an Anwei-class hospital ship, the Daishandao (or Peace Ark); a Fusu-class replenishment ship, the Gaoyao Hu; a Dalao-class submarine rescue ship, the Changdao; and two surface combatant ships, the Luyang II-class guided-missile destroyer Xian and Jiangkai II-class guided-missile frigate Hengshui. 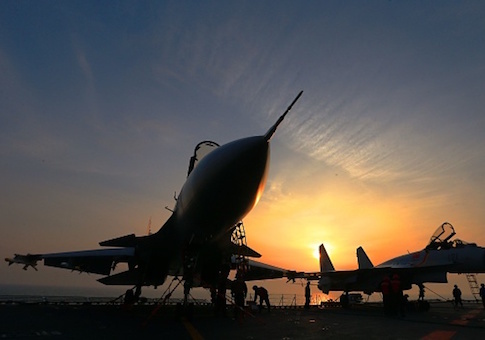 As it did in 2014, the PLA for the 2016 exercises also dispatched an uninvited intelligence-gathering ship to monitor the exercises—a gesture of Beijing's unfriendly intentions, a defense official said. The disinviting of the Chinese navy contrasts sharply with the Obama administration's conciliatory policies toward China that sought to play down or ignore China's creeping takeover of the South China Sea, as well as Beijing's widespread human rights abuses, aggressive cyber attacks on American companies and the U.S. government, and theft of secrets. Retired Navy Capt. Jim Fanell hailed the Pentagon's action as a step toward correcting an unbalanced policy in dealing with China. "Today the secretary of defense has restored the United States of America's credibility in the Indo-Asia Pacific," Fanell said. China since 2012 has made a mockery of international norms, by illegally seizing Scarborough Shoal from the Philippines, by illegally building seven new artificial islands in the South China Sea, and by rejecting international arbitration dismissing China's territorial claims, he said. "This decision to disinvite the PLA Navy from participating in RIMPAC 2018 sends a clear signal that the U.S. will not reward bad behavior by the PRC in the maritime domain with the privilege of participating in this premier naval exercise," Fanell said. Fanell warned that Navy leaders in Hawaii need to remain on guard for China to dispatch another PLA intelligence ship to Hawaiian waters as done in 2012 and 2014. Fanell is a long-time critic of unfettered military engagement with China and stated in a recent article that the initial invitation in June 2017 would "someday be remembered as the formal beginning of the end of U.S. influence in the Indo-Asia-Pacific region." In May, Chief of Naval Operations Adm. John Richardson said allowing China to take part in RIMPAC was "the sort of thing that brings us all together in sort of positive, constructive ways." And the recently retired commander of the U.S. Pacific Command, Adm. Harry Harris, also favored allowing Chinese navy participation. He said, "our goal remains to convince China that its best future comes from peaceful cooperation, meaningful participation in the current rules-based international order, and honoring its international commitments." Fanell said the notion that engaging the Chinese in military exchanges will produce a moderation in China's policies was "akin to superstition." "When objectively examined there is scant empirical proof that navy-to-navy engagement with the PRC has changed or will change their behavior," Fanell stated in a U.S. Naval Institute article in July. "Nor is there any proof that regional tensions have abated," he said. "The overwhelming evidence, in fact, points in the opposite direction. China's behavior and actions have become more recalcitrant, more aggressive, more dismissive of the rule of law, and more dangerous to the Indo-Asia-Pacific region despite the United States' engagement policy." As an observer in 2012 and participant in 2014 China sent an intelligence-gathering ship "to vacuum-up signals intelligence on the U.S. Navy and our allies," Fanell said. "This is akin to a neighbor who comes to dinner at your house and, during the course of the evening, looks through your medicine cabinet and steals the password for your wireless modem," he said. Fanell noted that despite Chinese participation in the exercises there was no slowing of construction and militarization in the South China Sea. Nor has China reduced pressure on Philippines, Vietnam, Indonesia, or Malaysia over fishing and mineral rights in the sea. China also has failed to accept the 2016 ruling from the Permanent Court of Arbitration the said China's claims to sovereignty over most of the South China Sea were invalid.